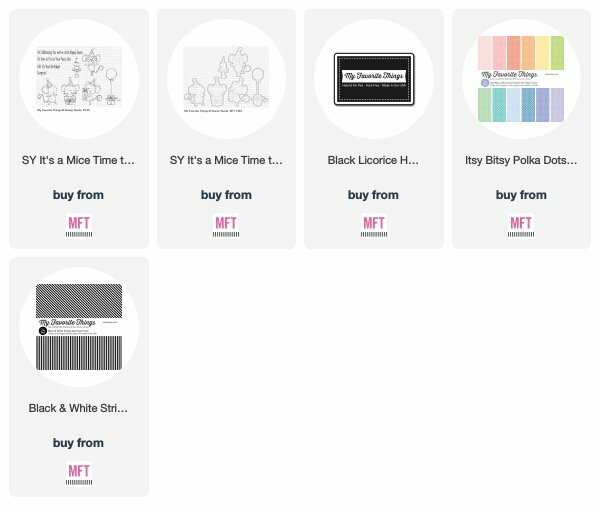 MFT February Release Countdown Day 5! Gosh it is that time again when the DT bring you loads of inspiration with yet another release.. So to start you out we will start of course with Day 5 of the countdown.. I worked with the set called Mice Time to Celebrate…such a cutie set, I stamped out and coloured the images that I wished to use then die cut and set aside.. I kept the rest of the card pretty straight forward as to let the images shine.. I took some pattern papers from Itsy Bitsy Polka Dots Pastel and Black and White Stripes, adding a piece of each of these to base of the card.. I then stamped a sentiment at the top of the card and added my images in between..
Finishing off by adding some enamel dots.. I will be back tomorrow to share even more with you..